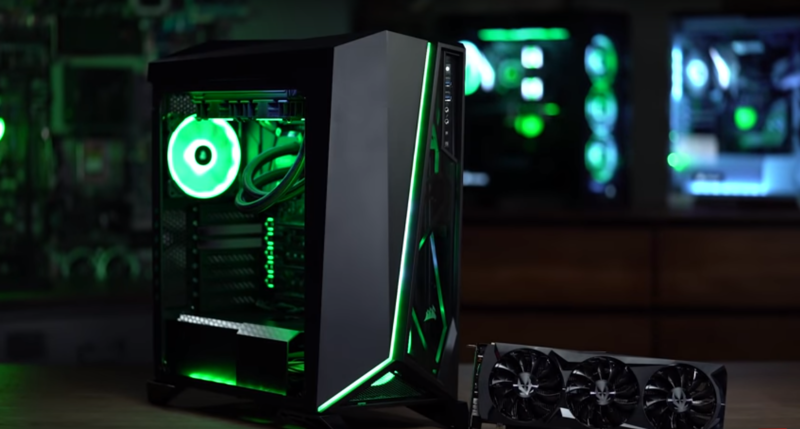 To go along with our ongoing GeForce RTX 2080 and 2080Ti coverage, we’ve assembled a celebratory build in the Newegg exclusive edition Carbide Spec Omega RGB chassis from Corsair, which you can see in the video above. This unique version of the Carbide Spec Omega features four Corsair LL120 RGB fans for fully customizable lighting. The normal version only has two Corsair HD120 RGB fans, which wasn’t nearly enough lighting for us. Corsair’s Spec Omega RGB chassis also feature an asymmetrical, fully addressable RGB strip on the front end. After seeing this list, you might be wondering why this build contains some older-generation parts. Well, that’s because in the coming days you’ll get to see some top-of the line super PCs with top of the line, current gen parts, and we didn’t want anyone with a slightly older build feeling left out. Through the magic of the PCIe bus, there’s really no reason a brand new GeForce RTX 20-series GPU wouldn’t work in a slightly older system. Also, MSI’s Z270 GAMING M7 board renders greens beautifully, which perfectly suited the color scheme of this build. Stay tuned to Newegg Insider for more GeForce RTX 2080 and 2080Ti content.